One of the main problems they were facing was resistance to change. Big firms have procedures deeply assumed and employees won’t participate easily in a process that most of the time meant trouble for them, and sometimes was even considered a threat. The higher management couldn’t communicate the benefits of the change to middle managers and employees. We were asked to design a digital service that could handle this change process and engage the users effectively. User research showed that when employees were personally explained the benefits of the change process, they were motivated to participate. It was detected that the current tools (mostly Excel sheets) weren’t appropriate to transmit this. Something completely new was needed: a personal avatar to relate each employee directly with the change process. And NOOA will be that avatar. User engagement was the biggest challenge here. Employees needed to participate in the change strategy, not only passively (following instructions) but actively. Their NOOA avatars are designed reflect their statuses: if they were active and productive, the avatar was healthy, is they weren’t, the avatar languished. The personal link between the employee and the change process created by the avatar brought the engagement that didn’t exist before. 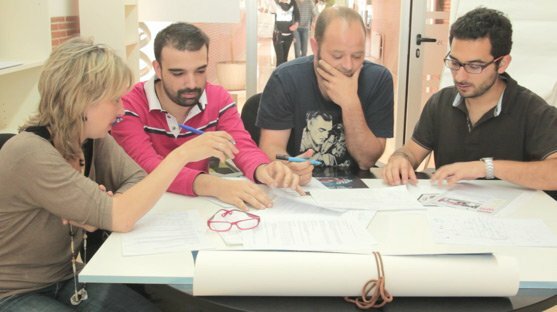 BeHappy created a service that could connect the interests of the employees with the interest of the company, helping both to understand and embrace change. The digital transformation of the change management was not just a digital version of the old procedure, but a completely new strategy developed from scratch to implement the know-how into a new platform that could take advantage of the digital opportunities that the offline world can’t provide. We focused a lot into understanding all the stakeholders of the project. If you want to create a digital service that can meet the expectations of all the users (employees, middle managers, top managers) you have to design a user experience that looks like the system was made just for them. User experience research, and a deep understanding of the business goals and procedures is key for a project of this kind. For example, gamification was present at the employee and manager level, but at the administration level, the tools were designed to provide a view of the system from a business success criteria. Relaxed and approachable person who likes to socialize. In charge of productivity management in a medium sized company of manufactures. Too many clicks to access information. Giving feedback is too complicated. Difficult to see how the individual players are doing from the manager view. 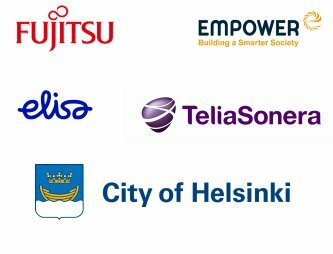 The digital service had many pilots in Nordic companies like Fujitsu, Elisa, Empower, the City of Helsinki or Telia Sonera, who launched many challenges to support their change processes. The feedback of each pilots helped to define and develop the next sprint of the development with real world data. Developing digital transformation lead to new opportunities of smart management. 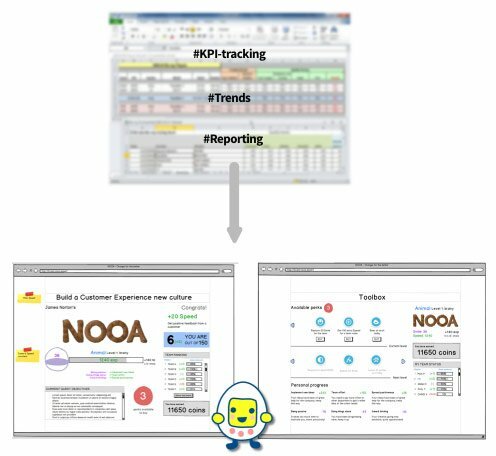 For example, NOOA was able to tell insights that were hidden before: which employees were real team players, what departments were collaborative, where the proactive staff was (and where to add more efforts to improve). New tools are being defined to make the most of this new data. NOOA was designed to be multi-device thanks to its responsive and adaptative user and business centric interfaces. Access was easy and straight forward no matter where the official systems or devices of the companies were located or the service was deployed. The backend is able to implement different gamification techniques and currently and new API is being integrated to share the insights NOOA produces with other business tools. 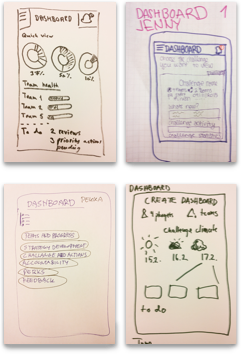 The gamification was important in the service design, as a way to guarantee an easy onboarding of thousands of potential users. Promoting user engagement was the main effort in NOOA, the custom User Experience was core for the different motivational games. A complete rewarding system was also designed, which included badges related to specific goals and gifts from the company to keep the employees interested in contributing to the change strategy. It was encouraged to form teams around the business goals and suggest new actions, which produces an improvement also in the social environment of the company making managers and subordinates to share interests. Sharing, playing and competing in the company game itself just for fun. Digital transformation has been one of the words of 2016. But behind every famous word there is a reality: businesses are facing challenges that require them to change, and to change today means to change into the digital. This change requires technology but mostly required to adopt a new behavior. 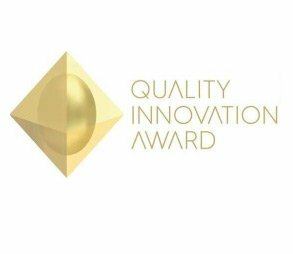 BeHappy helps companies to embrace change correctly designing and creating tools like NOOA, and we will keep doing in the future to many other kinds of industries. Gather good data is extremely important to any business process. Data will tell you if you are doing the right thing. 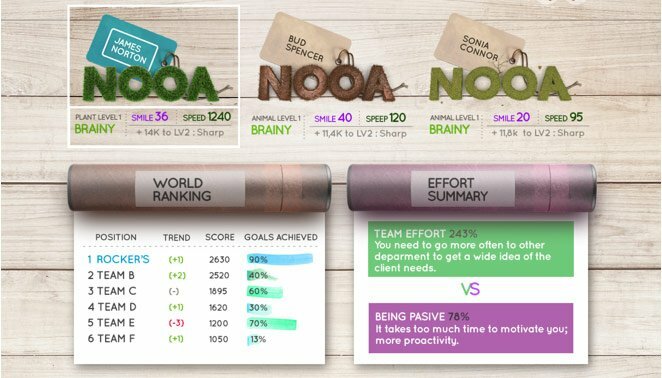 The administrator view of NOOA provides a complete reporting dashboard to keep track of the progress and positive effects of the game in the results of the company, with success criteria directly taking from the company plans, tied to the configurations of the business games.